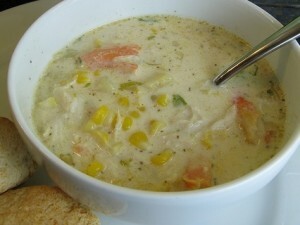 This chowder is my favorite of all. I’ve always liked creamy chowders more than brothy or tomato ones. Two years ago my husband and I went on a “lunch date” to Hoboken. We always (as many of you know now) like to go to farms and spend our weekends in the country side but we decided to changed it a bit and we picked Hoboken. As we were walking on Newark St. we saw a board outside a restaurant with the specials. Crab and Corn Chowder was one of them. We definitely wanted to try it out. I had the best chowder ever! Many times I feel like people get cheap on the cream and just use corn starch or more flour than the recipe needs to make it thicker and call it chowder. The recipe I’m about to share with you and that I have made many times is thickened just with the cut potatoes that this recipe calls for (potatoes will release enough starch to be used a the thickener element). I also add a little bacon to mine but if you are a “peschetarian” like I used to be you can leave the piggy out! In a pot start sautéing the onion, garlic, celery and red pepper on olive oil. If you wanted to add bacon you will add bacon to the olive oil before the veggies are added and stir for about 5 minutes or until the bacon starts getting crispy. After veggies are getting softer add the bay leaves, old bay seasoning, corn kernels and diced potatoes. Stir and add the broth. Lower heat to medium and let it reduce and concentrate for about 15 minutes. Check if potatoes are cooked and lower heat a little more. The broth should start getting starchy and thicker from the potatoes and the time reducing. Add crab meat and heavy cream and let it reduce for another 7 minutes or so until it start getting right texture. Check seasoning and add salt and pepper to taste. Enjoy! I love crab…Every way. What a perfect dish for this wintery weather!! !